There are those albums, for me, which become part of me for a specific time in my life. This summer, I wrote about Owl City's cd, Ocean Eyes, which made me happy (and still does, actually). That music provided the backdrop for my life, and I know that every time I close my eyes while listening to it, I will go back to that time and place. Now, I have a new album. 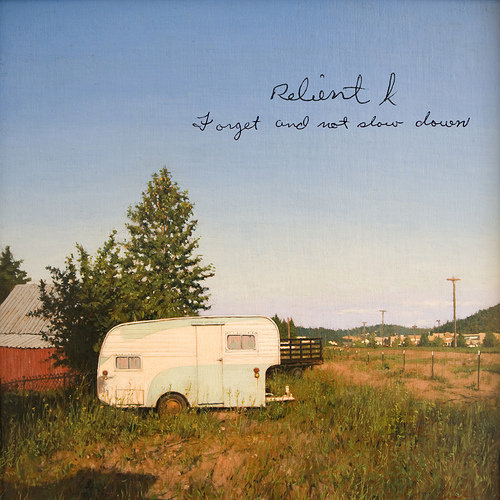 Relient K just came out with a new record (a record record record (if you don't get it, don't worry)) called Forget and Not Slow Down. After years of punky, fun, pop-cultury songs (and lots of sappy love songs), this is something new. Now, don't get me wrong. I LOVE Relient K. I passed out at their concert this summer because I had to go EVEN THOUGH I HAD THE FLU. I have written many entries about my imaginary relationship with Matt, the lead singer. I get how wonderful they have been. But, this band has taken me somewhere new, and I'm loving it. I learned from a very reliable source (amazon.com) that Matt went through a break-up with his fiancee and that this event prompted the writing of most of this album. Whether this is true or not, the band has done something special here. There are no pop culture references that I can find, but there is an openness that I've never heard before. I listened to this album all at once with my eyes closed and nearly cried. The beauty of the pain that I could hear reflected in Matt's voice, and even the music, was phenomenal. Part of what is phenomenal about it, is that I can relate. I know how it feels to break up with the one you thought you were going to spend the rest of your life with. I know all the feelings that Matt takes his audience through on this album. I too am starting to be healed enough to let the experience inform a new side of my creative work. This album reminds me that even pain I couldn't imagine ever going away can become something lovely and unique, something that resonates with people. With me. I'm writing a piece of metafiction right now (fiction about fiction, for those of you not aware). In it, I'm trying to get a character out of a bad relationship, and she's afraid to make that move. The more time I spend in this story, in a place that would have been very painful just a few short months ago, I realize that God's promises are true, He does bring healing, and beauty. So, if you're a fan of Relient K, or have ever gone through a break-up, I would highly recommend Forget and Not Slow Down, and if you're looking for a REALLY sweet deal, I'd download it on Amazon.com, where you get the exclusive track which was worked on by, drumroll, Owl City. Ahh, the best of both worlds.